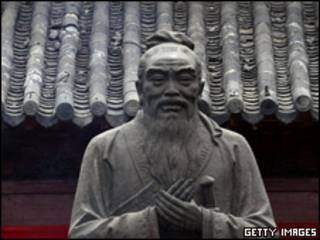 A film is to be made in China about the life of the one of the country's most famous thinkers, Confucius. The decision marks a resurgence there in the teachings of the philosopher who lived two-and-a-half thousand years ago. Lights... cameras... philosophy... An unlikely subject for a blockbuster with an unlikely leading man. Chow Yun-Fat, the star of numerous Hong Kong gangster movies, is to swap his sub-machine gun for the scholarly robes of Confucius. The film could also seem unlikely given how the ancient thinker fell out of favour in China. Chairman Mao Zedong said he belonged to the feudal age, and the Red Guards of the Cultural Revolution destroyed his grave. But that was in the 1960s and 70s. Now China's leaders are turning to Confucius to give the country some spiritual guidance. His emphasis on harmony and self-discipline, without reference to God of course, has been endorsed by the president. Confucian texts have been given greater prominence in universities and the government is now partly funding the 20-million-dollar film. So what wisdom can we expect up on the silver screen? Better a diamond with a flaw than a pebble without? Or perhaps one suited to Chow Yun-Fat's earlier movies: before you embark on a journey of revenge, dig two graves.